Tteokbokki or ddeokbokki is my another favourite of Korean foods. I usually made it from scratch. 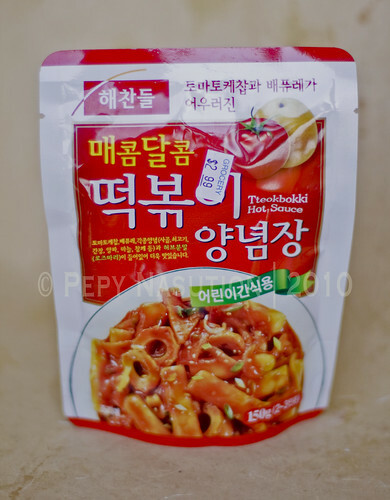 I meant I didn’t make it from a pre-package of Tteokbokki sauce, just like when I made tteokochi or ddeok-kkochi. When I drove from Pembina area and would do grocery shopping, suddenly, my mind was thinking to stop by the Hyundae Mart on Grant Ave. I was about to buy more fishcakes since I still had ricecakes and gochujang at home. Well, I didn’t only bring fishcakes. I bought an instant tteokbokki mix sauce and ready to use. But, I still added more onion juice and chili pepper. Definitely, I’m going to put Hyundae Mart on my Where I Shop page. All you need is cabbage, fishcakes, ricecakes, green onions and the tteokbokki mix sauce. In this post, I ‘d like to thank the Chicken Farmers of Canada blog for the interview (how did my interview go?). I was surprised the moment I saw an email requesting for interview. rasane koyo opo kui, pepong? Congrats on the interview, Pepy. I have to look for this sauce!